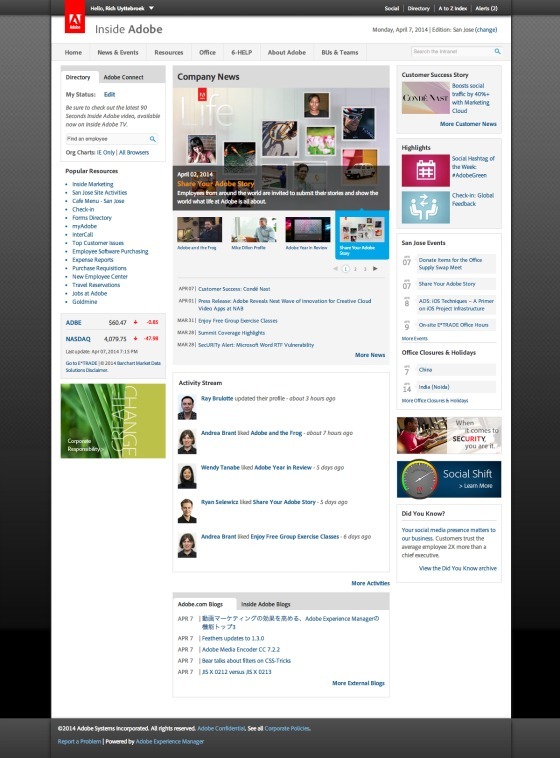 The all-new Inside Adobe launched in August 2013 and represented a complete reconstruction of the Adobe corporate intranet. The new Inside Adobe merged several separate intranet sites into one unified platform and dramatically simplified the navigation experience, organizing frequently-accessed sites and services into six megamenu categories. In addition to delivering tailored content for specific office locations and employee groups, the new intranet fosters connections and collaboration with other employees through new social features, such as article commenting and discussion forums. It looks great and hope would be best site…..
All information that i need to know is in one place. Contents arranged logically and is easy to search. best function is search. no need to go hunting.. It looks awesome. All info at one single place to access.